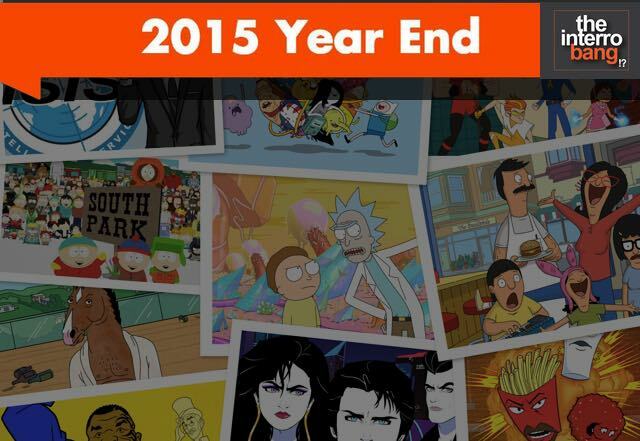 2015’s been one of the strongest years for animated series in a long time. The amount of voice talent, the technology to animate and the various distribution outlets have created a perfect storm. That being said, Adult Swim still seems to be the top dog in brutally original and hysterical animated programming. Though FX, Fox and Comedy central do not slack off at all. Below are the best animated series of 2015. Rick & Morty is an animated series that follows the exploits of a super scientist and his not so bright grandson. Think of it as cross between ‘Adventure Time’, ‘Aqua Teen Hunger Force’ and ‘Back to the Future’. Even though it may not be known to anyone over the age of 29, it’s one of the funniest cartoon in the last 5 years. It’s airs on Adult Swim. BoJack Horseman was most beloved sitcom horse of the 1990s after staring in hit TV show “Horsin’ Around”. 20 year later, is only a washed up TV horse with nothing going on. The show follows BoJack as he bums around Hollywood and complains about everything. The cast is voiced by Will Arnett, Amy Sedaris and Paul F. Tompkins, just to name a few. Bob’s Burgers has been a consistently funny show on Fox in a time slot that is surrounded by Seth MacFarlane shows and the slowly dying Simpsons. It follows a small family that owns are burger shop in a city similar to Coney Island, BK, or Ocean City, NJ. The cast is hilarious and Bob is the centerpiece to a family of funny, strange and oddly relatable characters. It has been a much watch show since its debut in 2011. Archer is an espionage parody show that focuses around a secret agent who is cocky, an elite killer, and total dunce. The show takes on a funny James Bond vibe and now been able rebranded itself with new plots that involve drug deals and the rise of ISIS. It’s a flagship show for FXX. It’s no secret that South Park has had somewhat of a downturn in recent years, but in this last year, the show has provided us with one of its best seasons yet. The satire of this year’s South Park has the cultural pulse of America. From politics, to political correctness, to gentrification, South Park has now more than ever done something that’s Matt Stone and Trey Parker has mastered for years now, which pointing out the absurdity of the world we live in the funniest way possible. If you haven’t seen the latest season of South Park, it’s a much watch. Moonbeam City is a parody of 80s cop shows like Miami Vice. The series is a bright, throwback, neon colored spectacle and something could be taken straight out of Neuromancer. It also has a feel similar style an anime cartoon, but is all American. Created by Scott Gairdner, the series is voiced by an all-star cast that includes Rob Lowe, Elizabeth Banks, Kate Mara and Will Forte. 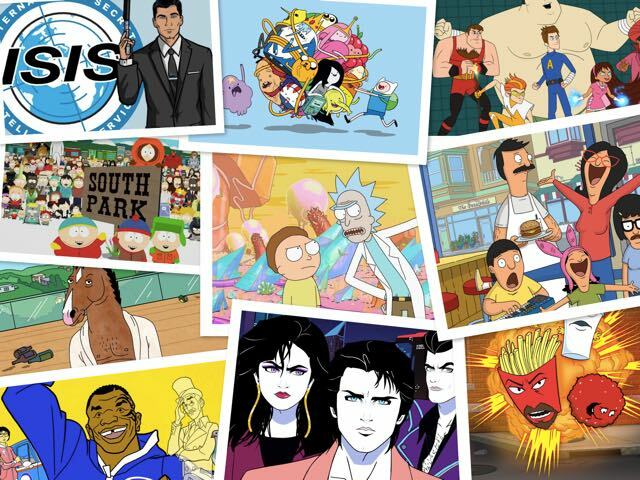 Mike Tyson Mysteries is produced by Warner Bros. Animation for Adult Swim. The series features Mike Tyson solving mysteries in the wackiest ways possible. Told and drawn in the style of in the style of ‘Scooby-Doo’, ‘Jonny Quest’ and ‘Mr. T.’, Mike Tyson mysteries is voiced by the legendary fighter himself and is the weirdest show that you won’t be able to stop watching. Adventure Time is one of the few shows in history that both adults and children can enjoy at the same, but for different reasons. The storyline follows Finn and Jake, two best friends who travel the world in search of adventure. The show is cute and innocent enough for kids to enjoy, but also has just the right amount of toughness and dirtiness for adults. It airs on Cartoon Network. ATHF ended its long run on Adult Swim this year and fans are already mourning the loss. The show was one of the original Adult Swim cartoon show and it helped launch the network to stage it sits on today. It also paved the way for the weird outrageous programming that Adult Swim later became known for. With out Aqua Teen Hunger Force there would be no Adult Swim. The Awesomes is a show that centers on a gang of superhero misfits. Created by Seth Meyers, the Hulu series is an original parody about a nerdy hero that can only try to live up to his father’s legendary reputation. The writing is clever, the animation is sharp and the characters are super relatable. Pun Intended. F is for Family was released late in the year but its fast becoming a favorite of animation and comedy fans everywhere, and we’re adding it in now as a late but great addition. We’d expect nothing less from Bill Burr, who is also on our list of the top ten stand ups of the year. If you don’t have Netflix, here’s your #1 reason to sign up.